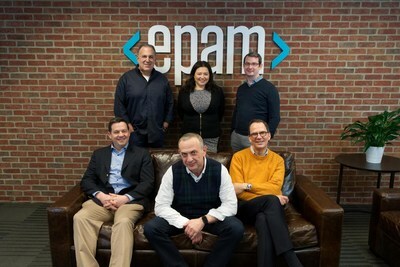 NEWTOWN, Pa., Feb. 7, 2019 /PRNewswire/ -- EPAM Systems, Inc. (NYSE: EPAM), a leading global provider of digital platform engineering and software development services, today announced that it will be the lead investor for the Global Opportunity Philly Fund (GO Philly Fund), Ben Franklin Technology Partners' new blockchain-enabled regional venture fund focused on seed and early-stage technology companies. Under the agreement, EPAM will anchor the initial $15 million close, as well as join the GO Philly Fund's Limited Partner Advisory Committee. The fund will make investments of between $50,000 and $500,000, and follow-on investments of up to $3 million, following Ben Franklin's proven due diligence process. With this investment, EPAM hopes to increase the company's exposure to the regional start-up community, as well as create opportunities to connect experts in the company, and the company's diverse client base, with emerging thought leaders. EPAM's lead status will also enable the fund portfolio to gain access to the company's rich global ecosystem of over 300 clients, 170 partners and over 50 universities and research institutions around the world. "EPAM has always been in the business of helping enterprises and software makers become, and stay, leaders in their respective industries," said Arkadiy Dobkin, CEO & President, EPAM. "Our new venture with Ben Franklin allows us to engage thought leaders and future disruptors at the very beginning of their journeys, giving us an opportunity to glimpse the future, and work together to make it real." Headquartered in Newtown, PA, EPAM employs over 650 consulting and technology professionals in the Greater Pennsylvania region, and its global presence includes over 30,000 employees in over 25 countries, and many Delivery Centers, Innovation Studios and Labs. EPAM is pleased to support Philadelphia's promising start-up community, which offers access to top talent and established networks of incubators and accelerators but remains underserved in venture capital funding. "We hope that our participation in the GO Philly Fund will create more opportunities for our employees and hybrid teams, as well as become a global pattern that we can repeat to more effectively participate in the start-up innovation economy," said Elaina Shekhter, CMO and Head of Strategy, EPAM. "Our goal of helping our clients become more competitive can only be achieved through direct engagement between EPAM experts and the full spectrum of innovators: from start-ups and business leaders to universities and leading research institutions." "We are proud to have EPAM as our lead investor in the GO Philly Fund," said RoseAnn B. Rosenthal, President and CEO of Ben Franklin. "As a thriving global technology company with headquarters in the Philadelphia region, EPAM's mission-oriented approach makes them a fantastic partner for GO Philly Fund's goal of sharing Philadelphia's opportunity with the world, while growing more outstanding companies at home."